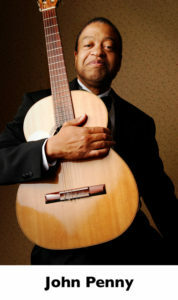 Minneapolis based guitarist and composer John Penny performs his original music on stages throughout the Twin Cities, and has performed in nightclubs in New York City from Harlem to the East Village. A wealthy amount of his music fuses Jazz with Classical and World Folk genres. His CD collection entitled Urban Tumble includes two pieces that morph between Jazz and orchestral ensembles. Of late, music of the orchestral nature has surfaced as his primary focus. Mr. Penny has composed music for numerous TV and radio commercials with such clients as Best Buy, Frito-Lay, and Group Health. Clients for corporate films including Honeywell, the Minnesota Twins, and United Way offered him opportunities to compose orchestral scores. John earned a BA in music from the University of Iowa. He holds a graduate certificate in Management Information Systems from Metro State University in St Paul, MN reflecting a time when music and corporate computer systems shared his attention.